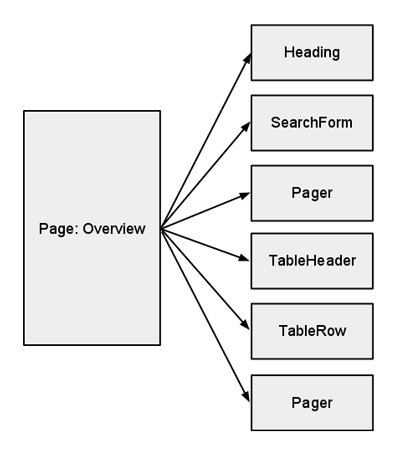 The regular page view contains the specific html and presentation of data for each rendered page. 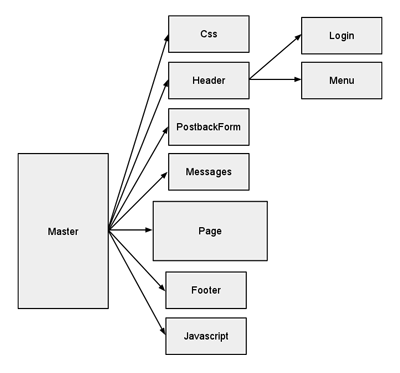 For html shared by multiple pages - like navigation, header and footer - every page has a master page. Both of these types can include partial views for small parts, that can be reused from multiple views. For example page navigation for display of results covering multiple pages, or widgets. Even if they're not reused it is useful to separate parts of your page view or master view to partial views, to keep the (master) view itself comprehensible and maintainable. For using partial views in the master view we have a special way to provide them with data (which is sometimes specific to the page requested, like which menu item is active). This is explained in the future part Poor Man's RenderAction. In the following diagram you can see the master page and it's partial views. A page view is shown in more detail later on. In the code above you can identify the inclusion of multiple partial views and the placeholders where the page view descending from the master view can show their html. This quite straightforward. The data supplied to the to the partial views makes it look like these partial views aren't strongly type, however they certainly are. Perhaps it's possible to provide the master view itself with a strongly typed model, however the effort is probably not worth it, because production issues rarely arise within the master view. The page view is a little bit different from the master view. For one, it actually contains the content for the placeholders present in the master view. The other difference with the master view is that the included partial views are called strongly-typed. Also notice, in the first line, that the view is strongly typed. All of our page views and partial views are strongly typed, no exceptions made. Furthermore, our rule is never (and I mean never) to share a view model between multiple views. Each view has it's own tailor made view model. The view model only has properties which are actually used in the view. Also, it is totally flat (only simple properties) and quite dumb. You wouldn't want to put too much logic in the view model, because it discourages reuse of the logic in question. To fill the view models from the domain model we use AutoMapper by Jimmy Bogard where possible and for the rest set it by hand in our presentation mapper classes. More on that in future part ViewModel and FormModel. Okay, enough for now. More on view models and form models in the next part.